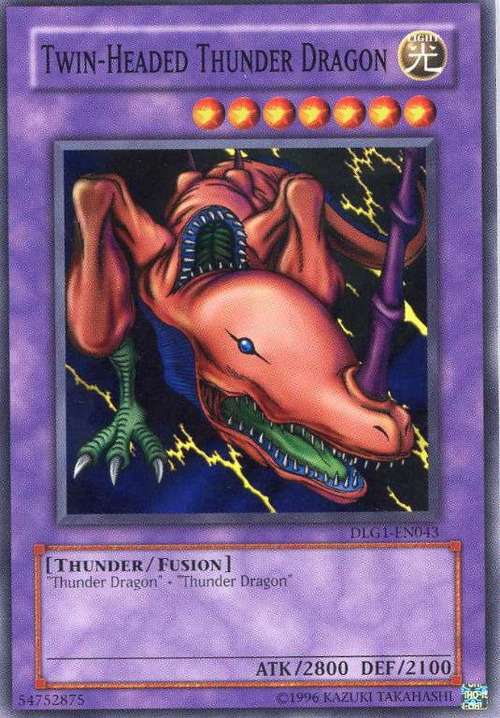 Despite this card being a Fusion of two “Thunder Dragons”, it has no resemblance to its materials in the way that “Blue-Eyes Ultimate Dragon” does, and its artwork is instead a recolored version of Two-mouth Darkruler viewed from a different angle. In Yu-Gi-Oh! 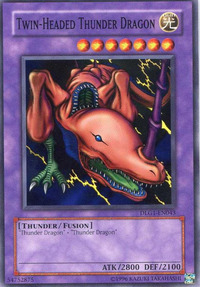 The Falsebound Kingdom, this card's Fusion Material Monsters are Two-Headed King Rex and Thunder Dragon, possibly due to the inability to use two of the same monster. This card is a Dragon monster in the anime, as it was shown being used alongside Seto Kaiba's Dragon's Rage. This monster does not actually have two heads in the artwork, only two mouths, but its hologram in the anime does and said hologram also includes wings not present on the card. In Yu-Gi-Oh! Duelists of the Roses this monster is also different; it has much more detail added that is nowhere on the original card such as a strange pair of arms attached to its legs. In Yu-Gi-Oh! Duel Links, when Summoned, this card's appearance shows that its horn is far longer than what's seen in the card's artwork, and also far longer than the horn on its anime appearance.